On 15th June, 3rd Year students in the Department of Computer Science returning from industry placements demonstrated their professional achievements with a poster showcase. On 15th June, DLG 19/20 in the Rhind Building was transformed into a sea of colourful posters. It was the venue for the annual Department of Computer Science’s Placement Poster Showcase event. Students returning from year-long industrial placements in a variety of industries, demonstrated their work experiences and achievements. The event featured 50 students alongside some of their managers. 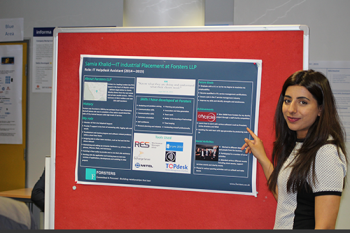 Organised by the Professional Liaison Unit (PLU), the Placement Poster Showcase provided an opportunity for students to communicate how they have developed on personal and professional levels within a relatively brief span of time. Staff and students were on hand during the competition to meet industrial placement students and it was an excellent opportunity for them to demonstrate how theoretical knowledge can be applied to real-life business problems and situations. 3rd Year students, Luke Robertson (BSc Business Computing Systems), and Alfie Palmer (BSc Computer Science with Games Technology) respectively, emerged as First and Second Prize winners. Robertson, whose winning poster incorporated Layar augmented reality technology, has spent the last year as an analyst with Accenture. He chose the multinational management consulting, technology services and outsourcing company because of its Future Technology Leaders programme. Luke is ‘highly appreciative’ of the City PLU scheme: “Through the PLU programme and my industrial placement, I was put under positive pressure in the sense that I was in a demanding role with a company with precise deliverables, alongside the constraints of a double course module. It was a very good experience”. Alfie, who has been a technical analyst with fast-food chain, McDonalds, during his industrial placement, says the advice provided by the PLU was “invaluable and will be of utmost importance for undertaking similar applications of this kind in future”. 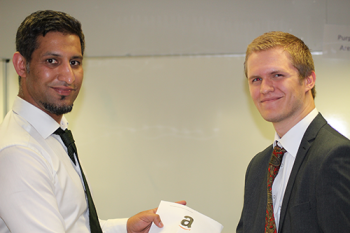 Mohson Khan, PLU Manager said: “We feel a great sense of pride in seeing our students develop on personal and professional levels on their return to City for the annual Placement Poster Presentation Day. These students represent the University and themselves to the highest standards in industry. This event provides an ideal opportunity for us to celebrate their achievements and congratulate them on their success”. Augmented Reality (AR) is the integration of digital information with live video or the user's environment in real time. AR takes an existing picture and blends new information into it. AR applications for smartphones include global positioning systems (GPS) to pinpoint the user's location and its compass to detect device orientation. Sophisticated AR programs used by the military for training may include machine vision, object recognition and gesture recognition technologies.